Moving to a new country can be a bit challenging and daunting. The process could be even more complex when one has no clue about the prospects of finding a job. Hence, before making the decision, it’s important to explore the skilled occupation list and thus pick up a career that has a greater protentional for higher pay and job security. General Labour: In Canada, General Labour comprises of a group of people who perform a number of manual tasks. They are mostly found doing jobs like loading and unloading, cleaning and sweeping, delivering materials, and more. Undoubtably, the occupation is the backbone of the Canadian economy and includes every function that is required to keep a business running smoothly. Sales Representative: Sales Representative is the second most popular job profile in Canada for the year 2019. Majority of highly sought-after businesses employ professional sales people who can aggressively sell their products and help them expand their business. B2B sales representatives are in high-demand and their ability to garner more customer base is one of the key skills that put them in a very attractive position. Accountant: Accountants are the most valuable asset to an organization, and why not? From evaluating the financial operations to performing the routine taxation work, they are the foundation to any growing company. The same goes with Canada. If you are an accountant, then a steady job is waiting for you in Canada in 2019.
Business Analyst: Business Analysts make an effective contribution to the overall development of a business. They play a vital role in making strategic plans, analyzing business operations, optimizing business systems, and more. With their skills in both technology and finance domain, they are the top-most choice among Canadian employers. Project Managers: Federal Government of Canada gives a lot of importance to Engineering Project Managers as they have a significant role in pushing the infrastructural needs of the country. From building condos to constructing robust bridges, the need for engineering project managers with optimum skills will continue to spur this year as well. Customer Service Representative: Customer Service Representative with significant skills in selling and CRM are regarded as the most valuable asset to any marketing firm. They are high in demand in Canada and will continue to be on the skilled occupation list in 2019 as well. Administrative Assistant: If you are working as an Office Assistant, then Canada is definitely a place for you to settle down. As an administrative assistant, you must have the skills to handle all day-to-day office operations, and perform clerical functions. People with optimum technical skills combined with an ability to perform routine accounting tasks are highly demanded in 2019. All said and done, above-mentioned are some of the highly-demanded occupations that continue to attract potential immigrants who wish to move to Canada. 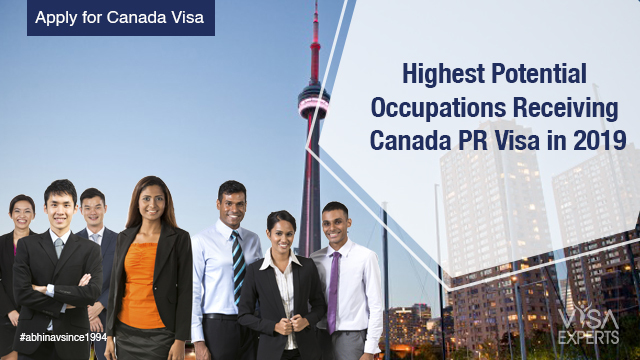 So, if you are already going through the Canada PR visa process, this article will surely help you find your potential career opportunity in Canada. What is the easiest way to migrate to Canada as a Software Engineers?